Worcester Park now has a new Police Safer Neighbourhood Team Sergeant. The blog understands that Sgt Andy De'Voreaux (pictured left) has replaced Sgt Colin Buchan (pictured below right) who had only been with the Worcester Park team since June. Sgt De'Voreaux comes to the team from the Sutton Safer Transport team and it appears to be a direct swap because apparently Sgt Buchan will now be on the Safer Transport team. I spoke with Colin Buchan a few times and while I didn't have much of a chance to get to know him I thought he was capable and professional and I would like to wish him well. 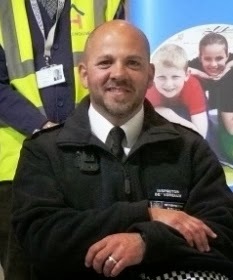 At the same time I would like to welcome Sergeant Andy De'Voreaux to the Worcester Park team, which covers both Worcester Park and North Cheam. Sgt De'Voreaux is currently off sick for a few days but I look forward to meeting him after he gets back.